Limebike riders pass in front of the former warehouse of Shelton’s Furniture on Morgan Street, November 2017. One Glenwood is really moving now. Across Morgan Street from the office tower site, the warehouse where Shelton’s Furniture was located has now been removed. The adjacent site will be the parking deck that supports the office tower. Plans for a future phase 2 mention a possible hotel on top of the deck but there are no solid plans out for it yet. 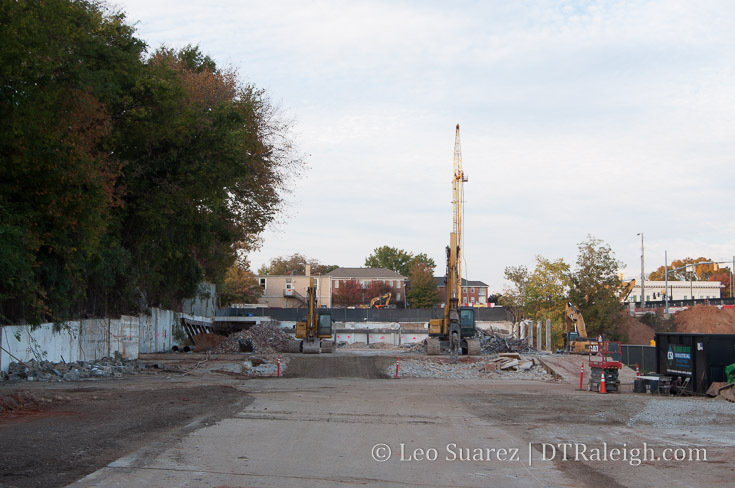 The parking deck will have a driveway along Morgan as well as Hargett Street. 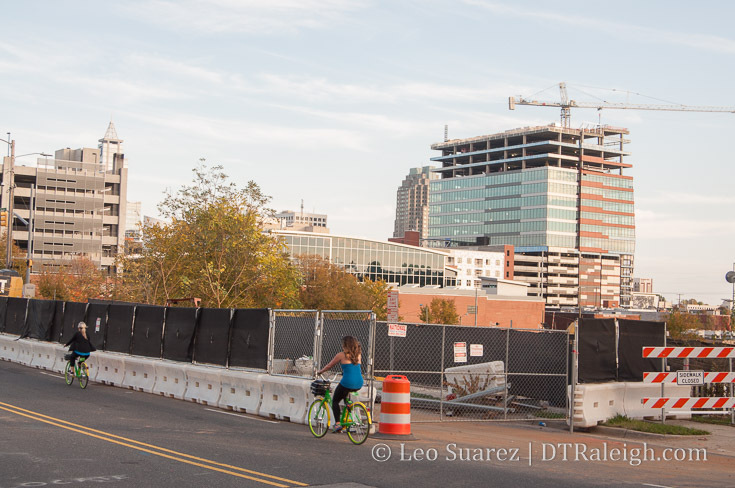 Staring at the One Glenwood parking deck site from Hargett Street, November 2017. Foundation work for the tower is also underway. That typically means a tower crane will show up soon for those following along. As always, Thank you Leo for your great updates! I wonder if Raleigh is unique in the tearing down of an old but interesting building for yet another parking deck that should have gone into the 10 story office building? Of course “they” say that they will build on top of the parking deck, but I am not so sure that they weren’t just selling the city what they wanted to hear? The hotel will wrap around the northeast corner of the parking deck. Not on top. The Dillon across the skyline is looking so unremarkable. This height and floor limit will turn Raleigh into a low rise square box bland machine once the Dillion (17 floors), 400H (20 floors), FNB (22 floor), Edison Office Tower (~19 floors), City Centre (20 floors) get built. Just parking lots, low density unable to support retail, and mediocracy. Oh well. Robert, no need to be sorry. I always appreciate your comments. As far as Fran is worried about, interesting architecture is definitely desired in downtown but for me, i just want more city, skyline be damned. Let’s fill the ground first before we fill the sky. I will say that I’ve never understood the ones who thought Dillon was so architecturally unique and pretty. Seems very odd to me. On a clear night you would enjoy going to the 5th floor parking deck @ Raleigh/Duke Hospital!Really pretty skyline scene ! I agree that the Dillon is looking to be a disappointment. The majority of the building is just a parking deck. And the dark orange bands between the floors already looks dated. Like I said, somebody needs to grow some balls and build something taller than 10 to 20 stories around here. Am I the only one that gets tired of everybody talking about Charlotte all the time. Raleigh has alot of potential but these developers and city leaders need to quit cutting Raleigh so short all the time. The space where One Glenwood is going should be a spot for at least a 30 story skyscraper. The Dillon itself should at least have been no less than 25 to 30 stories. Quit building all these 150 room hotels in dt Raleigh and build at least a couple 300 room hotels that way you can utilize the land, density and the need for more hotels in dt. Cmon Raleigh build smart not stupid, dt Raleigh needs much taller buildings and way more density than it currently has its that simple. You can’t be Robert, I’m Robert!!! To add to this, It seems Durham is getting its fair share of 25 story plus buildings. One City, Five Points project is rumored to now be taller than One City, American Tobacco is now rumored to have 2 30 story towers, and on the other side of the Durham Gateway there will be a 17 story tower. It is interesting to me how Durham seems to be getting these interesting projects but DT Raleigh is getting bland box towers. @Robert. It’s all about branding and Raleigh sits on its hand while Durham actively markets itself as cool, hip and a foodie destination. They foster the narrative that they are more urban than Raleigh when they’re not. They act like they are bigger when they’re not and they actively control the narrative on what Raleigh’s identity is. This needs to change yesterday! The city needs to take control of its own future. As it stands now, I fully suspect that Durham will steal HQ2 if it comes to the Triangle, even though they weren’t invited to participate because they are in a metro under 1 million. Raleigh, like usual, touted regional cooperation but you can bet your bottom dollar that Durham will be cutthroat and throw Raleigh under the bus if it gets the chance. They did it before with Money Magazine (anyone remember that?) and they’ll do it again. Don’t be fooled. This talk about Durham doing everything right is a bit hyperbolic. People complain about Raleigh having a “height limit” but forget Durham has an actual height limit (300 ft). If the Van Allen towers were going up in Raleigh, everyone would complain “oh look two more 10-12 floor boxes”, but Durham gets more leeway because it has a pretty meh skyline and anything helps there. Five Points is also likely to be 10-foors–at least every proposal has looked that way to me. And some of the best and only land for highrises north of the Durham Centre is going to be entirely lowrise office park. Let’s not lose our heads here. I think by the time Durham becomes the 3rd largest city in the state, it will look the part. It’s had a fantastic rate of infill the past couple years. Raleigh’s got nothing to complain about though. Once this midrise wave is over it will look a lot like Richmond or Orlando, and the perception of the city among outsiders will shift when that happens. I was at Parkside the other night, looking up at the Dillon. It looks great from the east. Especially on Fayetteville Street. Really increases the perception that you’re in a big city, surrounded by buildings on all sides. The News and Observer property was sold of an incredible $24 million dollars, the footprint is 3 acres, that’s more than 3 times the area of the PNC Plaza tower in one of the most prime locations in all of Downtown Raleigh. Located between Fayetteville St, next to a park, and short walk to the Train Station. It would be foolish for the unnamed buyer/developer to build something less than 35 floors. That being said the lack of drive and imagination of Kane and other Raleigh developers, I’m ready to be disappointed when the news posts of what is going to be built there. My guess a 150 room hotel with beige and brown accents and made of wood and cold hard economics. @Vatnos I’m glad you mention Richmond. I’m always impressed by how big Richmond looks when I drive through on the highway. Downtown isn’t especially tall and lacks signature buildings but there are just so MANY buildings there in the midrise layer it looks bigger than it is. Raleigh is more populous but doesn’t look it; if nothing else the addition of so many midrise buildings will help the city look more urban. The big development difference between Durham and Raleigh will be the light rail. If Durham and Orange create a light rail system, development and density will take off for them. Where did you hear about the N&O site being sold? I know that they were near a sale last year? Do you have a link? The sale of the N&O site is supposed to close sometime this quarter. The buyer has not yet been named. In the meantime, it appears that Nancy McFarlane has won the runoff in the mayor’s race. I am super excited about the N&O site. It’s one of the few sites in downtown that shouldn’t get any complaints about building to tall (read casting a shadow). It’s also a large chunk of real-estate that could support a large number of housing units, hotel rooms, office space, parking and still be interactive with the very beautiful park. I would also add that any proposal here “may” effect what the city builds next door? More than height, I’m concerned about parking. Big (empty) parking decks do little for street activity — which then influences retail. The City has made some changes to reduce parking minimums, but reducing the demand for parking is also important. We must continue to push for better buses, smart implementation of the commuter rail, and other modes of transit that make it easier to get around without a car. Also, I agree with Robert, Raleigh definitely needs hotel proposals with more rooms. Light Rail to where, the Durham Bulls game. Light rail needs to be extremely focused or it will just be a sucking wound. It needs to go where the folks that need it the most are served, it needs to be on many routes, not just a few. Personally, I would use it to go to and from the Airport, Canes Games, Downtown RALEIGH and back. People that WORK downtown surely don’t live there and will need a reliable timely option to abandon the car. However, if I have to wait 30-45 mins for a train I will just drive and pay parking for the same cost. If it’s more of a bother than its worth people will still drive. I know money is not the point, these things are designed to raise property taxes along with (schools, parks, transportation, schools, schools, parks, transportation and schools). If we are going to do it we better do it right because you will paying for it the rest of the time you live I in Raleigh. One thing about Kane, at least he actually follows through with what he says he will do and fast! 1) Permits where filed on Nov 1st to rebuild the Metropolitan, the 200 unit apartment complex in Downtown Raleigh involved in the largest fire in DTR in over 90 years. Construction expected to take 18 months. 2) The City of Raleigh has officially approved a new logo for the city. Check it out, opinions are so far mixed but personally I feel like it’s an improvement over the old logo. @ Chueng , From what I understand , the city paid $243,000 to come up with this new logo ! Woah that’s cheap for the whole process that took many months through various design changes and committees and research and marketing, etc. Giving Raleigh a clean, fresh look that will help generate a positive image of Raleigh that may help bring in businesses and people into the city–generating millions of dollars in the long run. But maybe a $50 logo for Joe’s Discount Logo shop would do the same, though. I’d like to see the city loosen up its color palette for the logo to correspond to different uses. It doesn’t always have to be greenish. Could have had that logo done for free, a great local company if given the opportunity would have done it for free for the publicity and marketing value from the press release alone. @John532, check out the City of Raleigh Youtube page, they have a second video with different colors and such. @al, Only a foolish company would think that’s a good idea. No ‘great’ company is desperate to spend months and thousands of dollars dealing with the City of Raleigh to make a logo–‘for publicity’. You know it takes more than 5 minutes on photoshop, right? There was probably several meetings, committees, and a hundred design changes and iterations before going with this one. You know what’s great publicity? Showing that a Gamma Global City such as Raleigh will pay you good money to design a logo. @chueng oh yeah lol, sorry, slipped my mind that it is Government after all. My bad! On the logo topic, we all have to realize that it will be used for a few decades at a minimum. It will also be the thing that’s looked at nationally, if not internationally. Think about the Target logo pitch. I’d love to be in that room when the designers pitched that logo to the company executives. I do like the logo! I’m also a bit disappointed that I never got around to sharing my design for one with anyone from the city . . .
Am I the only one that doesn’t think a logo influences whether or not companies invest in a particular city at all? A bit off topic but related to downtown businesses. Has anyone paid attention to the fact that the Greater Raleigh Merchants Association, whose branding is all about “buying local’ decided to contract with a TV company, owned by the Disney Corporation and based over in Durham, while trying to cut out locally-owned WRAL who has broadcast the Raleigh Christmas parade for 44 years? Capitol Broadcasting is Headquartered in Raleigh across from NC State for those that are unaware. They are owned by people who actually live in Raleigh, not Los Angeles. Does anyone besides me see the hypocrisy in this decision? @Al, the Durham and Orange County light rail plan connected Duke, NC Central, American Tobacco Rd Campus, DT Durham, UNC, and RDU. They have left open the idea for Wake to join the plan, but Wake has refused to at this point. Wake has decided to focus on bus rather than rail. The light rail project has stalled due to unstable funding commitments from the state and federal governments. It turns out that Republicans don’t like rail very much. Hopefully it’ll become a reality soon, as the Triangle needs significant help in public transit. My dream is to hop on a train at Capital Blvd and ride it into DT. Development and density would shoot up all over Capital wherever there’s a rail stop. @Paul, Where did you get the information that Raleigh had given up on rail? Have you been attending the Wake Transit public input sessions? I thought that the sales tax increase that was voted for last year included rapid commuter rail service from Garner through downtown Raleigh and Cary and RTP to Durham using existing rail lines. Has that been abandoned? If so, I think that voters should be demanding an explanation. Speaking for myself I was voting for rail service. Too many republican (anti-everything) naysayers to push light rail to get the transit bond passed last November. Goal was to get the bond to pass, period….which was successful. Now you can change the scope of transit but had to get past the suburbanite “know the cost of everything, value of nothing” continent first. Maybe this is just a dream of mine… but if we want to truly be a city of the future, I really think a monorail system would be the way to go. The topography of the area is generally flat, a lot of the components could be manufactured offsite and trucked in for quick construction, elevating the stations would take some time, but overall, the rails/beams could just ride above the roads. I have no idea what the actual cost for a monorail system would be or maintenance costs, etc, but it seems (to me anyway) a lot of the hurtles could be overcome by elevating the transit system above the stop and go traffic (*cough* down the median of Capital and Glenwood for example). Again, the biggest challenge is elevating the stations and crosswalks above traffic to access the lines down the medians of primary roads. It could be designed to be easily extended along other routes, all tying into downtown at the new transit hub. Slightly off topic, but if we could figure out how to implement this and construct it in tandem with the long shot that Amazon chooses the Triangle… it would propel us into the future. @ Paul I agree, just want it done right the first time, really strategic and not just get something to get something, don’t pass the bill and read it later. The area will flourish when rail is added if done right, the last thing we need is to see empty trains, then it’s all for not. Wake should get on board with Orange and use the power of numbers. @ Nick, look at what they are doing in Honolulu with the raised rail. It is a complete nightmare, costs of overage can’t be calculated, it’s way behind its goal and the locals look at it like it’s a dinasour already. I didn’t claim Raleigh abandoned rail. I said Wake hasn’t committed to joining the Orange/Durham light rail project. The County Commissioners haven’t signed off in the plan. I wish the would, to speed up the process. The entire Triangle needs to commit to a quality, unified public transit system. All surrounding communities need to be involved as we don’t have high density. I think it’s an AC-branded hotel, which will be a great addition. This hotel will be pretty close to Two Glenwood, which means Glenwood South will have three. I don’t think we’re losing anything too great on the lot, and this kind of mid-rise should fit well in Glenwood South. Thanks for sharing! @Steve – Yeah, that stretch of Glenwood South is in desperate need of attention.. almost a dead zone from Plates to Snoopys on the west side. This will be a huge addition. The county needs to get the BRT and commuter rail, to say nothing of the regular buses, up and running before any talk of light rail. If done right, the BRT will be a huge step forward, but it’s way cheaper than light rail and the county still isn’t sure how to pay for it. Don’t misunderstand, I’d love to see a Triangle-wide rail system up and going, but the funding just isn’t there. There was a panel of experts who basically came to the conclusion that the Triangle just isn’t congested enough to get people out of cars and into light rail, at least not yet. @Steve. Your comment about how experts said that we weren’t congested enough is the crux of the problem with American transportation strategy…it’s reactive instead of proactive. While other countries plan for dense growth & transit, Americans presume an auto-centric model until it becomes painful and then we spend decades following the initial pain trying to react to it. Agreed. However, the money follows the expert opinions. So, even if the county went full steam ahead with a robust light rail plan, it would just end up in the “reject” file at the FTA. BRT actually has a chance of getting built, and if done right, we could eventually replace the bus lanes with light rail lines, and any TOD built along the BRT would complement the light rail. We don’t build densely outside the very core because we don’t have the transit. We don’t have the transit because we don’t have the density. See all the huge metros in Texas plus Atlanta, Orlando, Phoenix, etc. for a glimpse into our future. Yep pretty much that comment right there. Cities do not get built in America like they once did in the Northeast especially. Sprawl is our future there is no way around it. It seems for Raleigh especially with jobs being so spread out. Obviously we will never be on the same scale but i think Raleigh is growing more like Atlanta then anything. Pockets of development and density but mostly suburban style sprawl everywhere in between. North Hills is already on its way to being our smaller version of Midtown Atlanta or Buckhead. Light rail would get the ridership to justify its cost for a long time here in Raleigh because of the way the city is built. That said, significantly increased bus service and prioritization for alternative modes could allow for increased density in the core and along specific corridors. Many mid-sized European cities have highly functional (and highly utilized) transit systems without heavy rail or light rail systems, but they do prioritize transit in their roadway design and built environment. With visionary leadership who could radically change our zoning codes and roadway allocations to allow for increased density and improved transit, we could create an amazing transit city without rail. I can’t Believe Wake County would much rather have Heavy Congested traffic rather than light Rail…???? Help me to understand this. Yes…there in a need for increased Bus Service and Nighttime service, But City/government Officials are Not giving Light Rail a chance to Prove how effective it can be. A Light Rail for example from RDU to Downtown Raleigh or Downtown Durham would be a Prime example. So much talk about growth…growth….growth. Well with growth comes Infrastructure and Raleigh/Durham needs it Badly. (scratching head) it’s just me. Although reading the last comment – (Evan) BRT and a commuter rail would be a better option for the Triangle area as a whole. My father, a staunch Republican, became convinced of the value of Light Rail after riding the light rail from Salt Lake City airport to Provo, Utah. Rail is the best option, unless we can convince Elon Musk to bring his ideas to Raleigh. Check out Denver’s new plans for transit from their airport to city center. Fascinating. Did anyone attend the public input meetings for the Wake Transit plan? If so, was there a common thread of opinion? Evan, i went and to be honest those meetings were a review of the plan we’ve already seen so just another opportunity to weigh in on what’s going on. Paul, I am a moderate republican who supports investment in public transportation. I don’t think they are mutually exclusive. If a light rail can help a city grow long term and solve some serious issues, I’m all for it. Uncle Jessie, sometimes you only see what you want to see. Or what the media wants you to see. Uncle Jesse’s comment is exactly what’s wrong with the political landscape. Polarization and Us Vs. Them mentality. Keep in mind our state voted split ticket a year ago. Leo, did they discuss timeline or order of priorities at all? No, based on the feedback is how they want to arrange their priorities and timeline. Just to add to the earlier talk about Durham vs Raleigh and the construction booms. 340 Apartments to start construction right next to American Tobacco. Announced today and Demo starts tomorrow. I feel the amount of urban development in Durham is picking up, and the city, being smaller feels denser than Raleigh. Guys. My comment was a joke but your kind of playing into my point with the “us vs. them” nonsense. For the record I was also a “moderate republican” until 2010 when those voices were run out of N.C. &. National politics by the Lunatic Fringe. C) the rest of the video is laughable. “We have football. We ha e basketball”. WTF? They proceed to insult Seattle a couple times. Why would you think this is a good idea? They even imply Seattle gets more rain than NC which is also not factual. Hopefully the folks in Raleigh with actual science backgrounds were not stupid enough to make this claim. Amazon doesn’t need a city to spew a lot of facts. They can get that data for themselves all day long. What the smart applicant will do is make an emotional case for what it feels like to belong to that community and give a sense for happiness potential of its employees. Emotional hooks will win this horse race as data is data is data….boring. So far, I’m not very impressed with many of the new buildings in Raleigh – especially The Dillon whose scale is inappropropriate to the rest of the buildings on the street. Also, many of the new buildings downtown are too uniform, and not set back far enough from the street, and so, a kind of “wind tunnel” effect is happening downtown. It’s very unappealing, and confirms the thought that the city is being built for developers and speculative investment, rather than anything else. Every so often, a set back plaza should be built, or maybe even a micro park, to give the city dweller a charming place to congregate, recharge, or offer visual relief from all of the sterile glass and concrete. There is nothing exceptional about what is being built downtown. I agree that the new buildings as proposed are too uniform, though The Edison office building and Dillon would both be unique designs for downtown. As far as the “wind tunnel” effect, that’s just part of life in an urban core. Gathering spaces are good, but the number of spaces has to match the density of the population (both residential and office) or they end up being empty 99% of the time. Also, Dillon is certainly a different scale from its surrounding buildings, but it’s hardly “inappropriate”. Currently there are proposals for three 10-12 story buildings, and two more 20 story buildings within about a 3 block radius of it. Additionally, the remaining parking lots in the warehouse district will likely be redeveloped into at least 10 story buildings. @Deb Kling, are you serious? If the city only let buildings be built at “scale appropriate” we would forever remain a suburban hellscape. Downtown isn’t even close to having issues regarding wind tunnel and having setbacks with plaza’s was tried in New York and it really doesn’t add much to the streetscape. Try leaving the south once in a while and stop treating downtown Raleigh like Midtown Manhattan. The city just posted the plans for “The Willard” hotel and condos on Glenwood south. I actually like the use of brick and other materials. Good addition to that section of Glenwood that could use the infill. This with the addition of 1 Glenwood and this area will feel very dense soon.